I trust that everyone's Mother's Day went well and that everybody had a chance to eat a great meal with their loved ones. As for my family, we had it at my aunt's house where we ate lechon (roast pig) cooked in the oven. In the Philippines, where my aunt and mom where born, lechons are cooked in an open fire pit. It's neat to see if you can stomach watching an entire pig being cooked in a large skewer. This pig was cooked twice in the oven: two hours the night before at 300 degrees and another three hours the morning of Mother's Day also at 300 degrees. This was the first time I heard of cooking this way. Usually, you can cook lechon in the oven for 3-4 hours straight. The meat turned out surprisingly tender and moist. It reminded me of pulled pork. The best part is the skin. It was crunchy and juicy. Reminded me of pulled pork. Notice that part of the skin blistered. 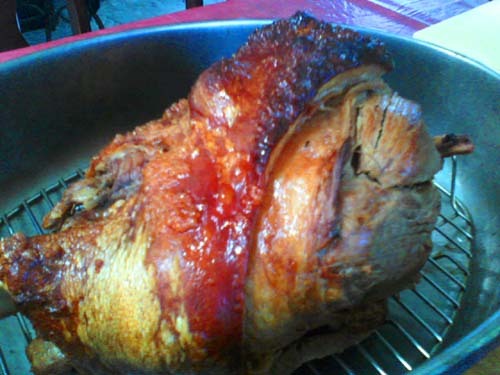 Most lechon have orange-golden smooth texture. Perhaps it's because of the double exposure to heat. I don't know. 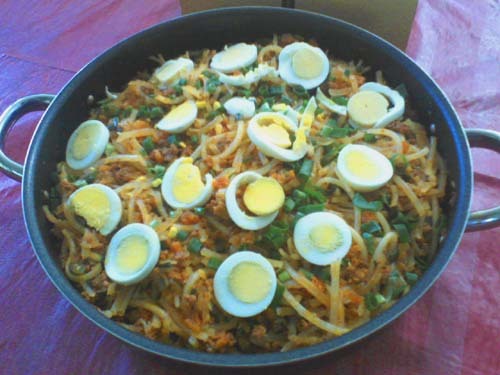 The other dish that was served was pancit palabok. It's a Filipino noodle cuisine with many variation. You can cook them with shrimp, ground beef, fish, and pork. This one is made with ground beef with the sauce premixed instead of being served separately. I'll have to make a separate post on the recipes for these two dishes, but I thought I'd share these pictures with you.